We try our best to get your interior to you as soon as possible. We know you are excited and we totally understand that. However we appreciate your understanding that quality can’t be rushed. We aim to deliver our luxury interior in 10-14 days. These times are based on averages from previous orders. Please note delivery can be faster and can sometimes be longer depending on how busy we are and what coutry you order from. Fit your mats into place in your vehicle, if your mats have it (some don’t), you will see little plastic swivels, these are to hold the mats in place. They fit in behind your vehicle trim. Give the car mats a few days to bed into the shape of your vehicle, it helps to put the heating on around the foot wells to help them settle into place better. On some occasions you may see a slight crease affect where the mats have bent over, this should fade over time but keep the heating on it and it will fade quicker. Q. What material is the interior made from? A. Faux leather. Very high-quality faux leather with revolutionary scratch and water proof technology. Very hard wearing and durable. Q. How do they fit into my car? is it difficult? Q. Can you ship to anywhere in the world? A. Yes we can. 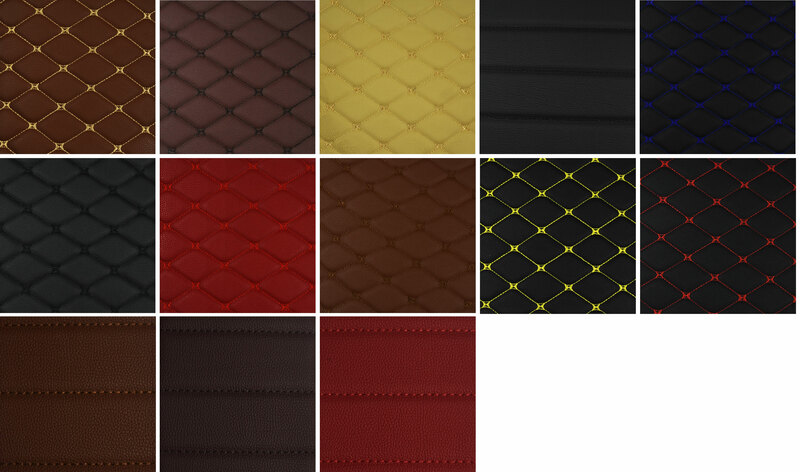 Luxmats is an international company. Our factory is strategically located which supplies all of our Luxmats representatives which make’s it just as easy to send anywhere in the world.